The new site’s user-friendly design offers information about the organization’s rich, 40-year history, a lending library for choral groups, detailed program notes, and a quick introduction to the 32 professional singers. (Sarasota, FL) Choral Artists of Sarasota, a Sarasota-based professional choral ensemble, has launched a new website. 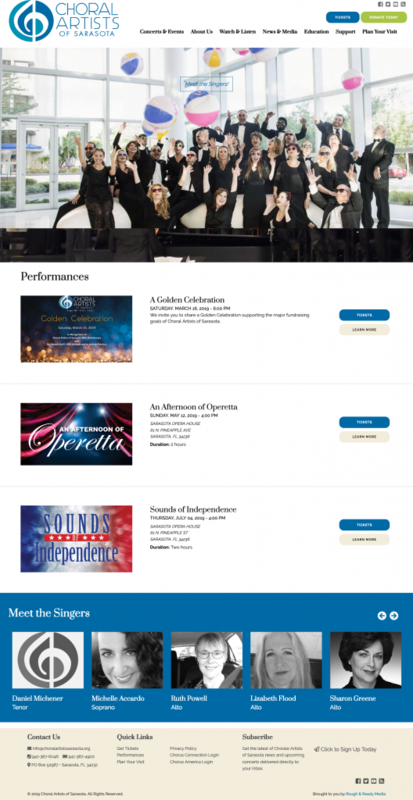 Designed by Michelle Greene of Rough & Ready Media, the new site offers a “fresh new look and a wealth of interactive tools for visitors, singers, choral groups, and educators,” says Susan Burke, executive director. The site’s address is www.ChoralArtistsSarasota.org. “The new site better reflects our organization and our mission,” says Burke, adding that the redesign was achieved over a yearlong process and was funded, in part, by an Immediate Impact grant issued by the Community Foundation of Sarasota County. Burke says the new site offers information about the organization’s rich history, beginning with Arden Fowler who founded the Gloria Musicae Singers in 1979. The new site also features a link to the Cordelia Lee Beattie Music Lending Library, a comprehensive music lending library.